These Baked Parmesan Chicken Tenders that I made this week were created to fit hand-in-hand with my Homemade Ranch Dressing. As a child (and now as a teenager) chicken tenders have been part of my life. There is no denying it. I am simply a chicken tender-fanatic. Most of them are fried, so I wanted to make something a bit healthier. I was surprised at how crispy these tenders turn out, even though they are baked. The Parmesan/ breadcrumb coating is very key to that. 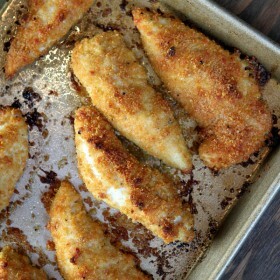 I found it really cool to know all of the ingredients that you put into these Baked Parmesan Chicken Tenders. Some of those frozen chicken tenders have a long list of scary ingredients! 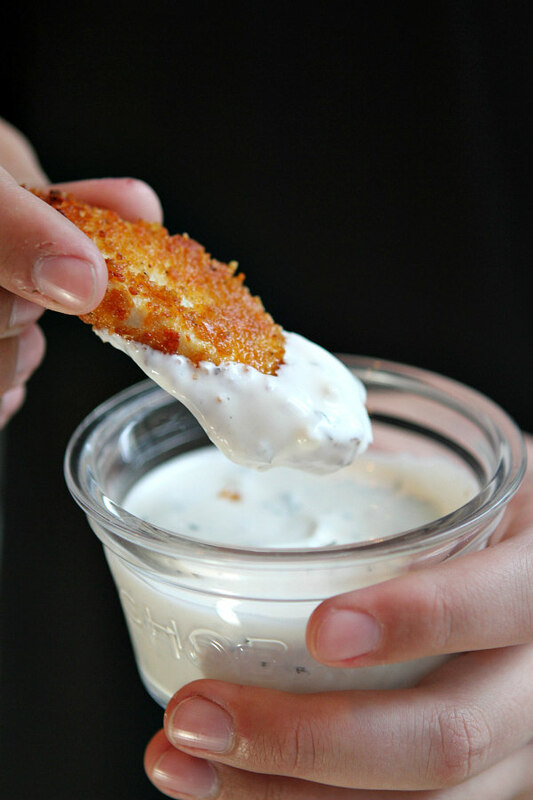 You can make this recipe complete with my Homemade Ranch Dressing recipe, the perfect dipping sauce! Butter! Or as people in New England call it, BUTTAH! Butter is drizzled on top before baking. 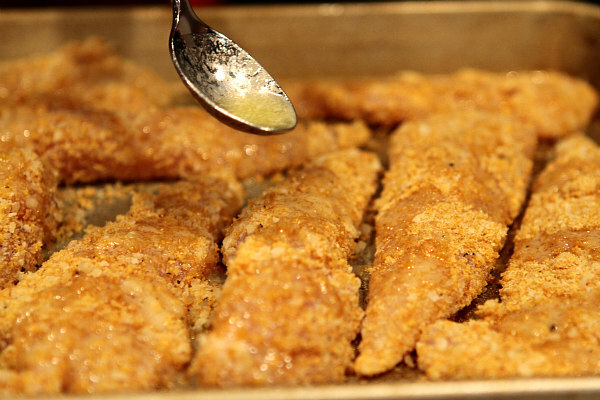 How do you make Baked Parmesan Chicken Tenders? 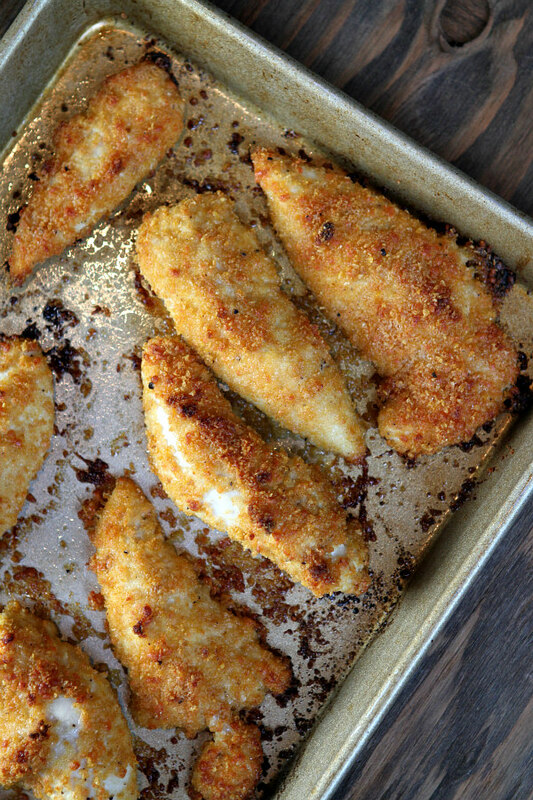 My Baked Parmesan Chicken Tenders are very easy to make. Just a little rolling around in the breadcrumbs, a plop on the baking tray, a drizzle of butter, and a journey into the oven! 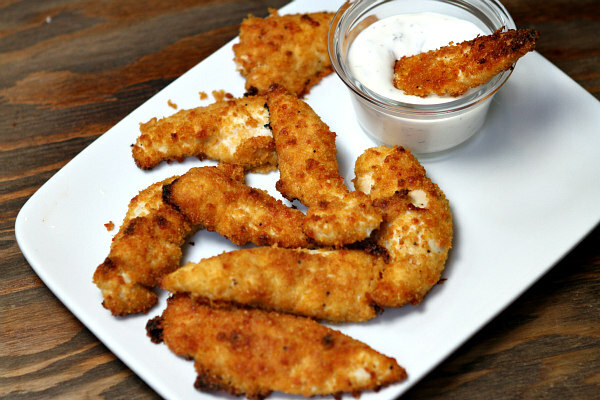 These chicken tenders complement my homemade ranch dressing very well (and the other way around). 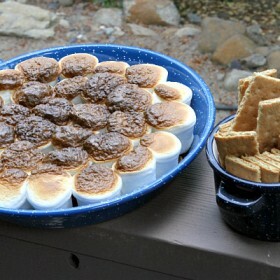 They are perfect- extremely yummy, and not unhealthy deep fried things! This is a great dinner for anyone, whether they are 13 or 30. Because who doesn’t love chicken tenders?! And even a kid can make a meal to complement a side (and the other way around)… Like Me! Click below to watch a video showing you how to make this recipe, then scroll to the bottom to print out the recipe so you can make these at home. If you’re a lover of chicken recipes, you might also want to try my Copycat Chik-Fil-A Chicken Nuggets or my Chicken Cheese Steak Sandwiches. This 3-Ingredient Brown Sugar Chicken looks pretty good too! Preheat the oven to 425 degrees F. Spray a baking sheet with nonstick spray. Place the buttermilk in one bowl, and mix the Parmesan and cornflake crumbs and place in another bowl. Place the chicken tenders in the buttermilk and let soak for about 15 minutes. Then dip each tender into the cheese/crumb mixture to cover completely, and place on the baking sheet. Drizzle the melted butter on top of the tenders. Sprinkle lightly with salt and pepper. Bake for 12 minutes or until crispy and golden and cooked through. Eat! These are really good dipped in ranch dressing. 12 minutes for chicken to cook? How small are your nuggets? yep, 12 minutes at high heat. That’s all you need with chicken tenders. Can I use another cheese instead of parmesan? well, it would have to be a hard cheese- like Parmesan or Romano. Asiego cheese is great for this dish! Really like your blog! I’ve tried a few of your recipes and my family loved them! These look amazing! Would the chicken need to already be cooked? I couldn’t tell from the instructions. No, you dip the chicken tenders and then bake them. My family loved the taste of these tenders but they were not crispy at all; it was more of a melted cheese topping. I used a corn flakes cereal that I crushed in a bag. I suspect that might be the problem. Would you please share the brand of corn flake crumbs you used? YIKES! First time I always do what recipe says. Sorry Brooks! Against my better judgement, I did not use parchment paper. Chicken stuck, burnt on the bottom, undone on top, when I flipped it over lost most of the crust. As for taste, WAY TOO MUCH PARM (for my taste) I had my printer ready, but alas not this time. Will still try your recipes though! Keep up the good work, after all I am only one opinion. all things said (above) the chicken was really tender and juicy though!! For 10 servings one needs 1-1/2 cups of cornflake crumbs and grated parmesan cheese (10 tenders) plus 2 cups of buttermilk if you are making 10 tenders at once and don’t want to wait an additional 15 minutes. Can I use panko bread crumbs for this recipe instead of corn flake crumbs? Maybe! I haven’t tried that. Had to cook a little longer but they were wonderful. Moist and great flavor. I used Panko instead of corn flakes. Can I do these in my air -fryer? I’ll bet you can- we don’t have one, so I haven’t tried! These chicken tenders are really great! I do cook them longer as others have mentioned. I cook them 20-25 minutes and they still come out just right. My husband says they’re the best he’s had. He even asked for them for his birthday meal. I also serve with Recipeboy’s homemade ranch dressing. 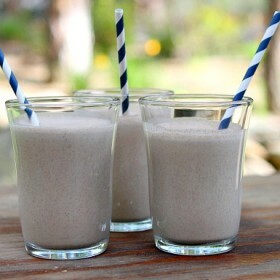 Wonderful, easy recipe…..thanks! Can I prepare them a day ahead and bake them the next day? My problem with tenders is the vein – it has to be sliced out, kind of gross. Takes time!